Chelsea Village is at 485 MacDonald Avenue, at the corner of MacDonald Avenue and Hastings Street in Burnaby. 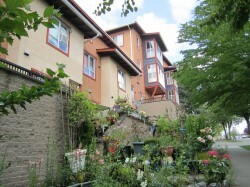 Built in 1994 by the West Coast Community Homes Society, it was acquired by New Chelsea Society in 2010. Chelsea Village is right next to numerous shops and restaurants on Hastings Street in “The Heights” district, making it a part of a convenient and accessible community. 43 family units; 16 apartments and 27 two-storey townhouses. Close to many neighborhood amenities and includes children’s playground. Laundry rooms; plumbing hookups available in townhouses for laundry machines. Rent geared to income; tenants pay 30% of gross household income, with no cap.